This authoritative continuing education course identifies the advantages of dumbbell training and offers program design concepts to meet specific training and athletic goals. The Dumbbell Training Course clearly defines the art and science of dumbbell training in order to assist professionals in developing resistance training programs using dumbbells for fitness and sport. This course uses the text Dumbbell Training, written by renowned strength and conditioning coach Allen Hedrick, to offer 15 programs for increasing power, speed, agility, and balance. 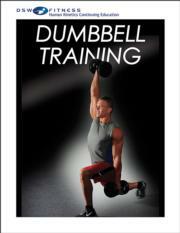 The concepts covered can be used with clients and athletes across a number of sports and fitness endeavors. Included are 78 exercises accompanied by step-by-step instructions, common errors and corrections, safety considerations, and training tips, making it simple to incorporate the exercises into client programs. The book features an exercise finder that describes muscles worked, whether it is a single-joint or multi-joint exercise, and the page number for each exercise. An accompanying study guide outlines the course’s learning objectives, helping to focus on the important concepts within the text. The study guide includes a table of contents, course syllabus, key terminology, chapter activities, and a referenced study guide answer key. This self-guided course allows users to work at their own pace and explore the material through a comprehensive text and study guide, finishing with a 50-question exam comprised of multiple choice and true/false questions. A continuing education course for personal trainers, strength and conditioning professionals, athletic trainers, health/wellness/fitness coaches/consultants, and group fitness/exercise instructors. Allen Hedrick, MA, CSCS,*D, FNSCA, coach practitioner, was named the first-ever head strength and conditioning coach at Colorado State University at Pueblo in September 2009. He earned his bachelor’s degree from California State University at Chico and his master’s degree from California State University at Fresno. For three years he worked as a strength and conditioning coach at the United States Olympic Training Center in Colorado Springs, Colorado. He then worked as the assistant strength and conditioning coach at the United States Air Force Academy, also in Colorado Springs, for three years before being named the head strength and conditioning coach at the academy, a position he held for nine years. In that position Hedrick was responsible for the strength and conditioning programs for football and volleyball while overseeing the academy’s entire strength and conditioning program. Hedrick moved to the National Strength and Conditioning Association's headquarters, also in Colorado Springs, as the head strength and conditioning coach and later as education coordinator. Hedrick stayed in that position until moving into his current position at CSU-Pueblo. During his career, Hedrick has worked with a variety of athletes, from elementary school age to professionals and Olympic medalists (speed skater Bonnie Blair and Greco-Roman wrestler Matt Ghaffari). Hedrick’s work has been published more than 100 times in a variety of publications covering diverse topics, and he has written a book on strength and conditioning for football. He has also produced numerous DVDs on topics related to strength and conditioning, including Strength for Sports Performance (Human Kinetics, 2007). Hedrick has spoken at various conferences and clinics worldwide, including Guatemala, Japan, Australia, and China. In 2003 Hedrick was selected by his peers as the National Strength and Conditioning Association's Collegiate Strength and Conditioning Coach of the Year.